The street is crossed by two tracks, the Union Pacific mainline and a Portland & Western track. There is one set of crossing gates. Afew feet north of the rail crossing, northbound traffic on Geary has to wait for vehicles on Salem Avenue, and when there’s lots of traffic on Salem, vehicles may form a line on Geary that extends across the two tracks. As result, when a train comes trundling along, the gates may well go down behind a vehicle that is trapped; it cannot move forward without running into other vehicles in front; it can’t back up because the gate is down and there are vehicles waiting there as well. If the driver heeded the signs and did not stop on the tracks, as in the video, no harm is done. But it’s still unsettling to pull up to a crossing gate that is down and see a vehicle standing on the wrong side of it. 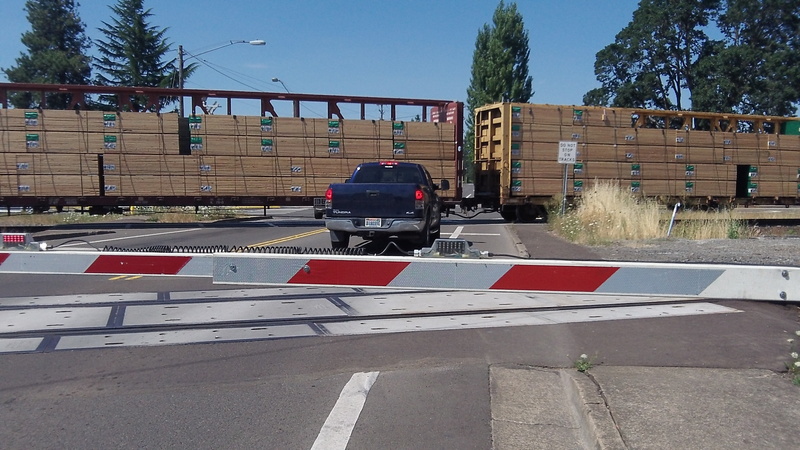 I use this crossing all the time and I will not advance into the crossing until there is space for my car out of harm’s way in case a train comes and the gates close. There is room for a single car between the tracks but not two. I have had people behind me honk at me for not moving forward when they think I should (requiring me to stop on the tracks until the car in front of me moves through the intersection), and have had people behind me stop on the tracks when there is heavy traffic on Geary. I always shake my head and wonder “what are they thinking?” as they leave themselves vulnerable and with no way out if a train does approach. It saves them NO TIME whatsoever to be bumper to bumper and stopped on the tracks. Just goes to show you can’t fix stupid.